He bought lunch for some of his entourage, and Brian Williams of NBC paid his own way. 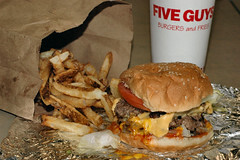 So, Michelle Obama’s been to Good Stuff, The President has been to Ray’s Hell Burger and now to Five Guys. Can we suggest Palena in Cleveland Park, Mr. President, for date night? What town did the potatoes come from? That is essential information posted at every Five Guys every day. Rigby, Moses Lake, Pasco. We want to know. Ray’s will pwn Five Guys. Nuff said. I wonder if he realized he was actually ordering a double cheesburger! Um, Bush didn’t go out in DC. That’s why we care. John: I’m pretty sure hardly a soul would’ve cared if Bush had gone to Butterfield 9 or to Burger King, honestly. No, I think John is right. People would’ve paid attention, but the Bushes just didn’t go out. I think they may have gone to Mexican place in NoVa once in the early part of the first administration. I second what John said…apparently Obama has gone out to more DC restaurants already than Bush did in his entire tenure. Don’t quote me on that. The Bush’s did not like DC and got away (to Crawford, or Maine) as often as possible. I wonder if there’s a geographic stimulus plan going on with the restaurant visits? The Obama’s seem to be hitting a wide spread around the city and suburbs. It’s nice to have a first family that really lives here. What John and Mike said. After eight years of a president never went out and did non-work-related things in the city, it’s a real change to have a president who wants to be part of the group who says… wait for it… We Love DC. Whatever it is, I’m just happy we can see the man about town, that the leader of the free world can be a part of his city, and not just stand atop it. I live SOOO close to that Five Guys. Of course, this happens on the one day that I’m not in town. Would have been fun to be close by. Good for him– this may help 5Guys shake off the karma of a few weeks ago!! Way to go Prez. . . I agree- its cool to have a commander-in-chief who actually lives here with us, rather than closing off the outside world the way Bush did. Of course, I don’t entirely blame Bush for hiding behind closed doors after the way things went for him… I don’t know if I’d go out in public either with his ratings.